Before revitalizing the menu at Canlis restaurant, Seattle chef Greg Atkinson learned an appreciation for local ingredients and gratifying meals on lovely San Juan Island, WA. In this reissued book of essays and recipes, Greg describes his appreciation the passage of the seasons, the joys of young family life, and, of course, local food. Atkinson is a gifted and passionate writer, observant of all the senses and emotions when it comes to great meals—whether a holiday spread or a picnic on the beach. Share one truly delicious year with chef Greg Atkinson. GREG ATKINSON launched the dining program at the nationally acclaimed Friday Harbor House on San Juan Island and revitalized the menu at Seattle’s venerable Canlis restaurant. He is the chef/owner of the award-winning Restaurant Marché on Bainbridge Island. Not since James Beard or M.K.F. Fisher has anyone written about food so honestly. In Season rings just as true to life in the Pacific Northwest now as it did seventeen years ago. Illustrated with evocative new seasonal images by Seattle photographer Charity Burggraaf, In Season is a reminder of how rich and rooted and delicious life is in the Puget Sound. Atkinson recognizes the way writing about something is like cooking it, the way reading is like eating. In the introduction, he writes, “Like putting thoughts on paper, putting food on the table is less a function of where it happens than what it really is. Bad writing comes from bad ideas, and bad meals come from bad food.” And there’s nothing bad in In Season. ...food memoirs are commonplace, but few are as well written as Atkinson's, which celebrates the passage of seasons, and the joy of preparing simple, gratifying meals with family and friends. And there are 70 recipes focused on the flavors of the Pacific Northwest, divided into different chapters for each season, making it easy for home cooks to explore what it means to be cooking in the here and now. "In the woods, finding mushrooms, my very soul is refreshed," writes Atkinson. His style is lyrical and inviting; the recipes have the familiar sense of place, of family, of comforting smells, of light. Reading the book, you feel as if you're sitting in a pool of sunshine, waiting for dinner to come out of the oven. 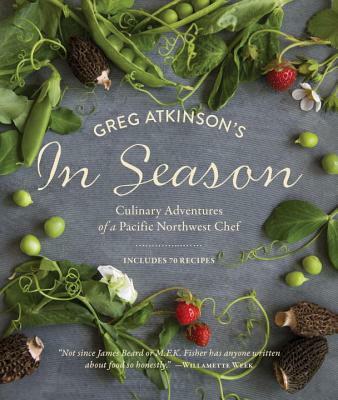 Greg Atkinson’s newly reissued In Season: Culinary Adventures of a Pacific Northwest Chef is more than just a cookbook, as it offers personal stories, food philosophy and kitchen advice alongside recipes... Atkinson preaches the good gospel of preparing healthful meals high in flavor but low in fussiness, always best shared in community with others. Much like his inspiration, M.F.K. Fisher, Atkinson writes observant pieces that respect the simplicity and spontaneity of the ingredients. A writer well before he became a chef, Atkinson regards food with the joy and appreciative wonder of first discoveries: learning to cook, cultivating gardens and harvesting the fruits of one's labors, foraging from the land and all the unexpected surprises bound with it. These experiences shape his understanding of food and, more philosophically, life in general. The stories are personal and emotional, a reminiscence into what once was and is now slowly disappearing. ...In Season remains relevant as a statement of what can be possible with time and commitment, and its content is meant to be savored throughout the year. [Greg Atkinson's] cookbook isn't just recipes, it's a love letter to all the seasons and the delicious gifts they bring. The dishes and essays encourage you to be more aware of your surroundings, appreciate the things that thrive in our charming region. And the recipes are simple -- you're not going to be spending days of prep on everything; the food is meant to showcase the ingredients as simply as possible, highlighting the freshness of each item.